I’m guessing most of you know that white wines are served at a colder temperature than red wines, but did you know there are actual recommended serving temperatures for each varietal of wine? I’ve found that these guidelines are not well known and consequently red wines are often served too warm and white wines too cold. You may be wondering: why does temperature even matter? The reason is because it plays a large role in the taste of wine. Serving wine at very cold temperatures will mask the flavor and aroma of the wine. Imagine you have a bad cold and lose your sense of taste. Then try eating one of your favorite meals. Not the same, right? It’s the same idea with cold temperatures and wine. On the contrary, if wine is served at very warm temperatures, it will lose its acidity and structure (and be labeled a “fat” wine). Think of this like drinking a flat soda. The carbonation in soda adds to the flavor and overall enjoyment of the beverage; soda just doesn’t taste the same when it loses its carbonation. Likewise, if a wine loses its acidity, the flavor definitely suffers. Now that you know temperature is important, let’s talk numbers. As I mentioned, white wines are served at a colder temperature than red wine, but there’s a common misconception that they should be served directly from the refrigerator. Do you know what the temperature is inside an average refrigerator? It’s typically between 35°F and 40°F. The ideal temperature for white wines vary by varietal, but tend to be in the range of 45°F to 55°F; that’s about 10 degrees warmer than the refrigerator! Chardonnay should be served at about 50°F, while Pinot Grigio and Sauvignon Blanc are best at around 45°F. Red wines, on the other hand, are oftentimes served at room temperature. But unless you keep your house at 65°F or cooler, you are serving your red wine too warm! The ideal temperature for red wines vary between 55°F and 65°F, again based on varietal. Pinot Noir and Merlot are best at about 55°F, while Cabernet Sauvignon, Syrah, Zinfandel, and Bordeaux should be served at 65°F. 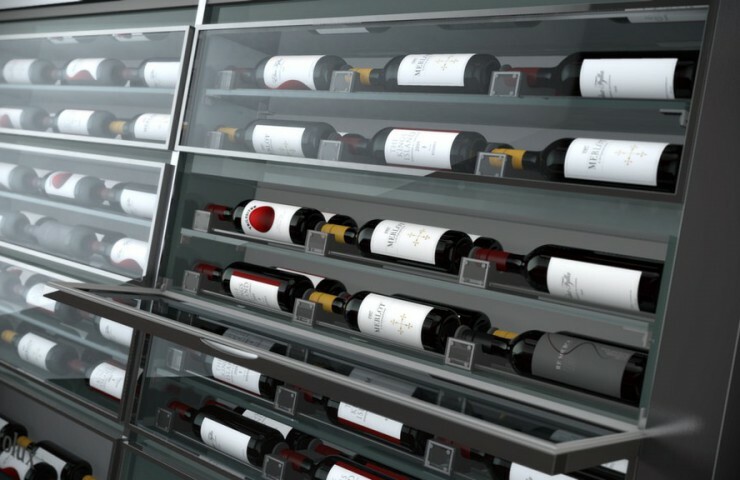 If you have a wine refrigerator, it’s much easier to control the temperature of wine. If not, I have some easy tips to ensure you are serving your wine correctly. If you’re drinking white wine, store it in the refrigerator, but remove it about 10 to 15 minutes prior to serving to raise the temperature. It’s also a good idea to have a wine chiller or an ice bucket handy so you aren’t constantly making trips to the refrigerator to chill the wine once you begin serving. If you’re drinking red wine, refrigerate it for 10 to 15 minutes before serving so it’s cooler than room temperature. It’s really that simple! I hope this sheds some light on recommended temperatures for wine and acts as a guide next time you’re serving wine!